Addictive, tasty and easy to make. Sabudana Vada – crisp from outside and is soft and melts in mouth with occasional crunch of groundnuts. Often made during vrat (fasting), this delectable dish is also made as a snack to be devoured along with hot cups of masala chai, specially during the rainy months. A dish from the state of Maharashtra, it is also equally popular in southern states of India, and is known as Sagubiyyam Vadalu (Telegu) and Javvarisi Vadai (Tamil). Remember to drop the vadas in hot oil but reduce the flame to medium and fry till they are golden – if fried on very high flame the vadas get brown/charred on the outside and the sabudana on the inside remains uncooked. You can also make the Sabudana Vadas in Airfryer. Remember to line the bottom of airfryer drawer with an aluminum foil before putting vadas in else the vadas get stuck to the wire mesh of the airfryer drawer. Wash the sabudana and soak covered with water for about 5-6 hours. Drain in a colander, keep aside for 30 minutes. Dry roast the peanuts, remove the skin and coarsely pound them. Peel and mash boiled potatoes in a large bowl. Mix drained sabudana, coarsely crushed peanuts,, green chili, coriander leaves, lemon juice, and salt and make a dough. Form flat vadas using oiled hands and deep fry the vadas in hot oil. 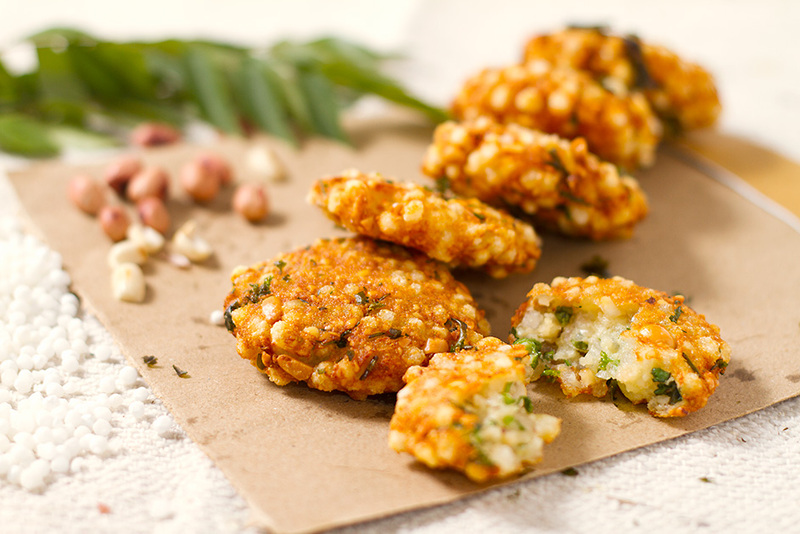 Serve the Sabudana Vadas hot with chutney or tomato sauce and a hot cup of tea. Very easy 3 steps sabudana vada receipe. Will try this evening.